Do you love summer? To be honest I’m not keen on the scorching temperatures and I really am not a fan of humidity. But there are so many things to love about summer! 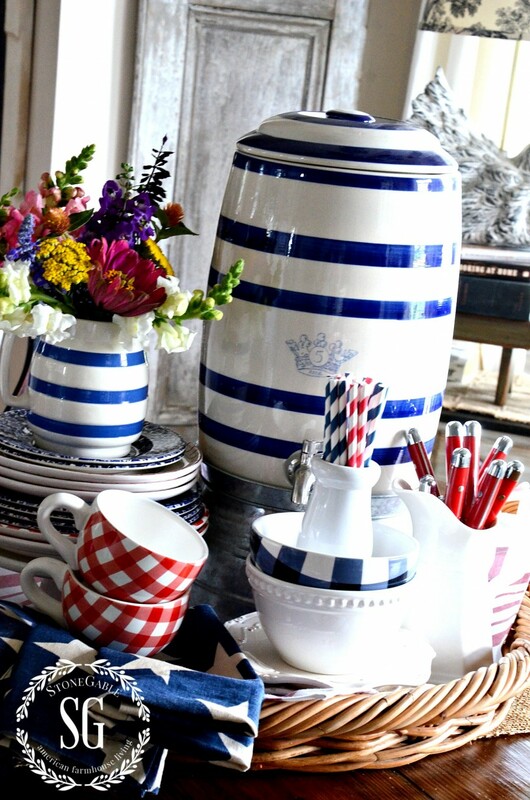 I’m adding a touch of red, white and blue to my neutral decor and celebrating summer in grand patriotic style! One of my very favorite things to create is a vignette of dishes and other things from around my kitchen for my kitchen table. I have this kind of decorating down to a science, literally! And it’s so fun to get dishes I don’t often use out of the cupboards and play! Here’s my latest creation! 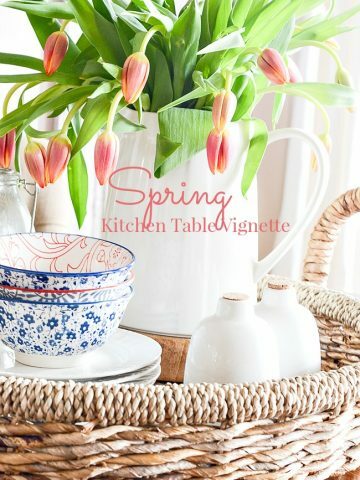 Following 6 easy rules for creating a kitchen table vignette (link at the bottom of the post), I used a big willow basket to contain the vignette on my round kitchen table. I’ve had this willow basket for years and I can’t remember where it came from, but I’ve see similar ones at HomeGoods and Decor Steals and Magnolia market. It’s my go-to container for the kitchen table. I put a red and white tea towel in the bottom of the willow basket and draped blue napkins with big white stars on the side. I try to use fabrics that will soften the vignette and whose colors work with the vignette and my decor! One important part of a kitchen vignette is to create a big focal point. This can be a big pitcher of flowers or a soup tureen or even a blue and white pottery drink dispenser on a galvanized metal base!!! The drink dispenser and the flowers on the stacked dishes on the small cake pedestal create a background of varying heights for the rest of the vignette! 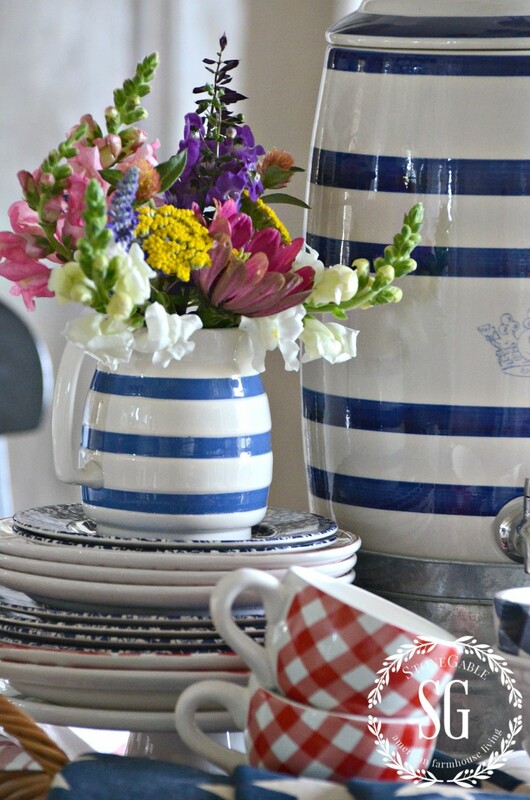 I love love love dishes and pulled many from my dish closet that reflect the summer holidays! Red, white and blues in checks, florals and hemstitch! LOVE these fun checked dishes from Heritage Lace! Stacking dishes and bowls and even cups varies the heights in my vignette. Our eyes love varying heights. They travel from one thing to the next and tell our brains it looks appealing! ALWAYS remember to vary heights in vignettes!!!! Don’t you love to play with dishes? These colorful drinking straws in a little white milk bottle adds an extra bit of color and fun!!! I get questions very often about my colorful flatware. I get them from many sources wherever I see them! I’ve collected red, white, blue, orange, green, green and white striped and brown. We often use them to eat dinner, wash them and put them back in the creamer! So easy!!!! I hope this post has inspired you to get your dishes out of the cupboards and play with them!!! Making a kitchen vignette is so much fun and adds a big splash of color and decor to your home!!!! C’mone! Give it a try! 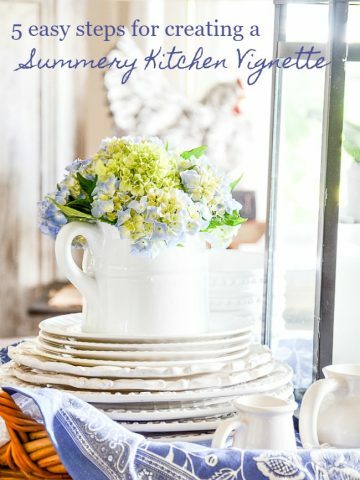 To see 6 TIPS FOR CREATING A KITCHEN VIGNETTE, an easy step-by-step post with detailed directions and lots of pictures click HERE. If you like this post and want to remember it for later, please pin it to your KITCHEN or DECOR Pinterest boards! You can follow me on Pinterest and see all the great things I’m finding to pin every day HERE! On the look out for white plates! Such a patriotic vignette. It reminds me of the fourth of Julys from my childhood. Sweet memories. Very pretty! Please consider posting about your storage for all these items. I’m picturing a warehouse in your basement! I don’t change things up nearly as much as you do, but I have been inspired to change up my mantle every month or so. It’s really pretty & has brought me joy! 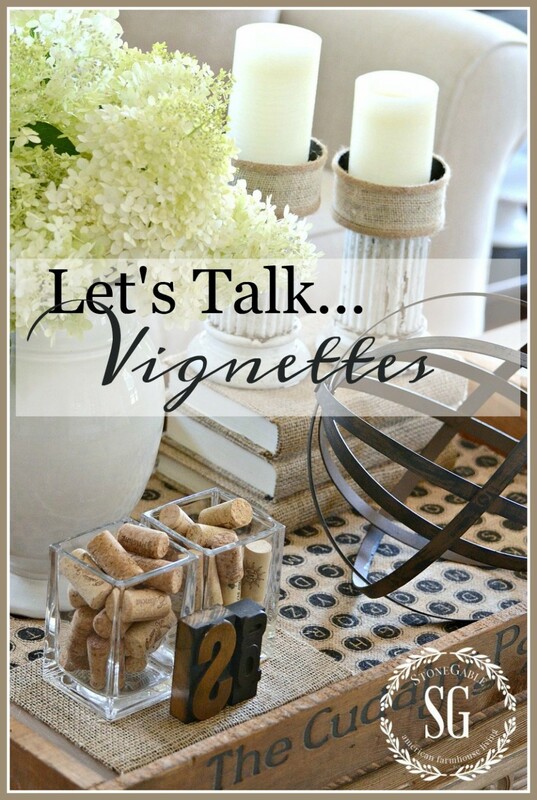 I love your vignettes! Since I have started reading your blog it has inspired me to think of what I have and how I can use them in a new way and .helps when I go to the Home Good store It helps me think of how many different ways I can use items..Have a great Day. Love your ideas!!!! Where do you store these wonderful pieces? Beautiful as usual. 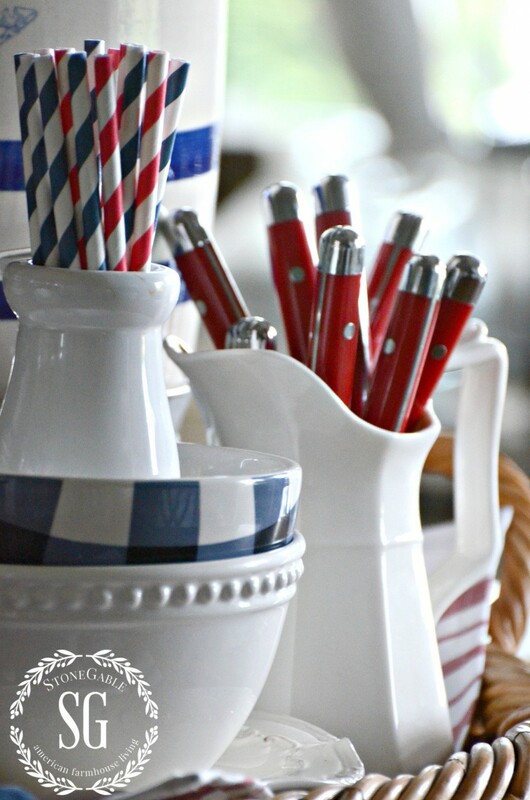 I love the patriotic theme — great for Memorial Day, Independence Day, and even Labor Day or year round. I wish I did have the room to have a collection of dishes for special occasions. My china cabinet has a bunch of “stuff” in it not very decorative but it is memorabilia. Your flowers are beautiful and I’m not a fan of heat and humidity. I can stand the heat a lot better than humidity. Have a wonderful weekend. Oh my goodness it all looks so pretty! I love the colors, they just shout Summer!! Love the Americana look! I searched all over the internet today to see if I could find anything close to the cute red and white cups, but wasn’t successful. The web site you reference only has black and white dishes, so I’m guessing you got them some time ago. Do you know the maker? I noticed you have a lot of Pottery Barn finds…my favorite store! I’m lucky enough to have one in my city and am a frequent shopper! 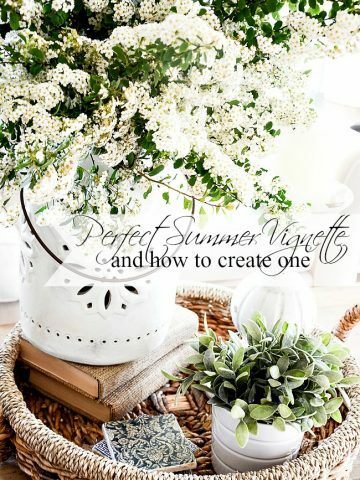 Love your summer vignette.. It so much fun to play with dishes!! We are still getting rain here in TX. 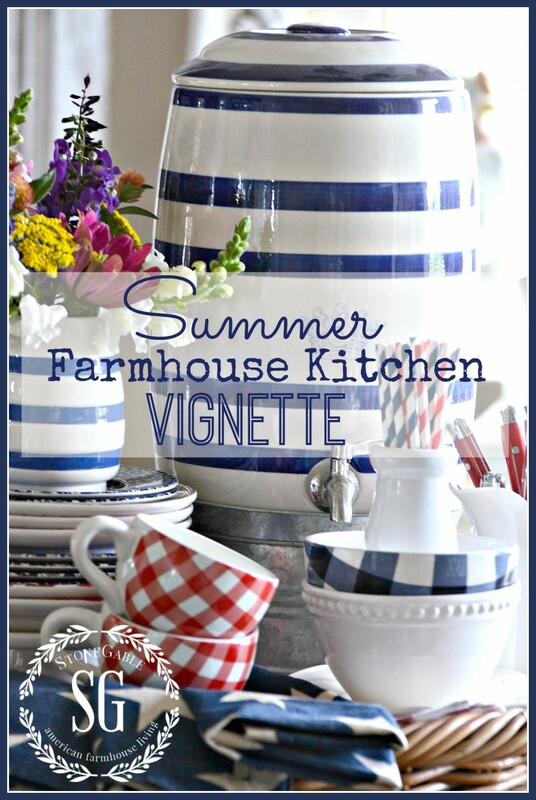 You have summarized your breakfast table with such glory of the summer!….the table vignette is always so beautiful with such incredible cottage/farmhouse charm…..and I heart that drink dispenser…..and great checked dishes!!! Happy Summer Yvonne! Your table is so beautiful; I wish they still had the drink dispenser! I love everything Americana!I When I entertain in July, each of my party tables is set up with different dishes so that I can use my extensive collection of red white and blues, and since I’ve also collected various designs of flag-lumbar pillows, everyone has one on his seat. I put flags all around my property on July 1st, and also in the front lawns of my elderly neighbors, who love to see my flags in their yard when they go out to get the morning paper. Did I say I love red/white and blue? I am a Naturalized US Citizen and very proud and blessed to live in this wonderful country. God Bless America, you, and all your followers. What a beautiful comment! I am a proud American too! Love your cool, crisp summer dish display. Happy Summer! Beautiful summer vignette! Love it when you play with dishes!! 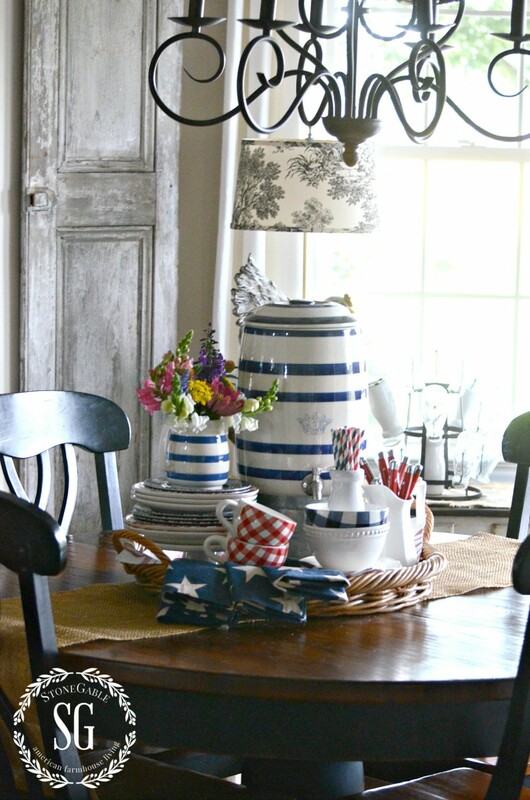 I love your red, white & blue kitchen table vignette…..perfect for summer! 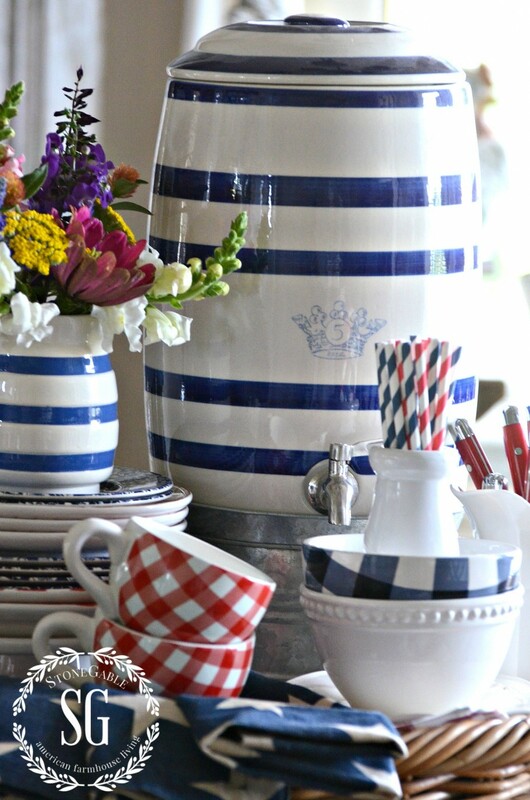 You are always so inspiring and have a way about displaying dishes….thanks so much for sharing! So cute. You know I love those checks! I love your vignette and always appreciate ideas for changing up my dining room table. The flowers from your garden are beautiful….my tiny little garden had a tragic encounter with a ground hog this week, so I’ll have to satisfy my need for flowers through you! Thanks for your summer ideas! So happy summer is finally here!!! Lovely, as ever and I’m with you on the humidity, it makes my hair go frizzy!